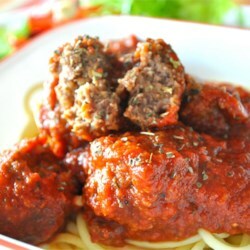 Great recipe for meatballs! I used minced garlic instead of garlic salt, 1/4 tsp. of red pepper flakes (was adding hot sausage to the sauce as well and didn't want things too spicy), and used an egg in place of the skim milk. This was a nice change from my usual meatball recipe - thanks LTH!